The annual event, hosted by Piedmont Trial Regional Council Area Agency on Aging, consisted of a walk-off, vendor fair, music, informational exhibitors and personal document shredding. In addition to participating in the days activities, Professor Mewhinney and Daddino used this event as a platform to share information about The Wake Forest Elder Law Clinic. Through the Elder Law Clinic, students get practical experience under the supervision of managing attorney, Professor Mewhinney. During the school year, the clinic provides free legal services to the community in Forsyth and surrounding counties. To be a client of the Elder Law Clinic, a person must be at least age 60. Also, they must have an income of less than $1,800 per month for a household of one, and less than $2,400 per month for a household of two. 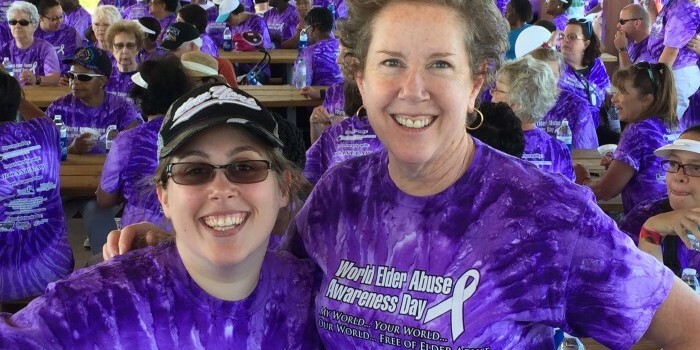 The purpose of World Elder Abuse Awareness Day is to provide an opportunity for communities around the world to promote a better understanding of abuse and neglect of older persons by raising awareness of the cultural, social, economic and demographic processes affecting elder abuse and neglect. Visit www.ncea.aoa.gov for more information.